The Netherlands was the worst hit country by the crash of Malaysia Airlines Flight 17 (MH17) in eastern Ukraine, with 193 Dutch citizens being killed in the incident. Charlemagne’s notebook writes on the effect the crash has had on the country, noting that in proportion to the overall Dutch population, the impact was larger than the September 11th attacks on the United States. Meanwhile at the Strategic Europe blog, Judy Dempsey asks seven experts whether they believe ‘interests trump values’ in Europe, in light of the EU’s response to the disaster. Nina L. Khrushcheva at Project Syndicate also assesses whether the crash of MH17 might be a tipping point for Vladimir Putin, arguing that a struggling Russian economy could begin to put pressure on Putin’s regime. A similar theme is taken up by Sascha-Dominik Bachmann at the OUP blog, who questions whether this might be Russia’s ‘Lusitania moment’, referring to the sinking of the British passenger ship RMS Lusitania by a German U-boat prior to the entry of the United States into the First World War. Myriam Benraad at the European Council on Foreign Relations writes on what she terms ‘France’s fascination with Israel and Palestine’, following pro-Palestinian protests in Paris last weekend which ended up in violence. She notes that while the country has a stake in resolving the crisis from the perspective of foreign policy, the French government should also see Israel-Palestine as an issue which has significant domestic implications for France. The Economist also addresses the issue, stating that French authorities are increasingly worried by the issue of anti-Semitism and that events in Israel and Palestine risk inflaming this situation. Given the success of several broadly populist/anti-establishment parties in the European Parliament elections in May, a number of commentators have put forward proposals for improving European democracy. Carolina Johnson at Policy Network discusses the potential for participatory democracy to act as a solution to what she terms the ‘oversimplified and reactionary politics’ embodied by populist parties. She writes that while allowing citizens to participate directly in local governance is unlikely to remove the appeal of populist politics, it might help to strengthen the affinity for democratic institutions among citizens. Jeremy Bowles at Bruegel writes on the risk to European jobs posed by new technologies, such as automated processes which remove the need for manual labour. 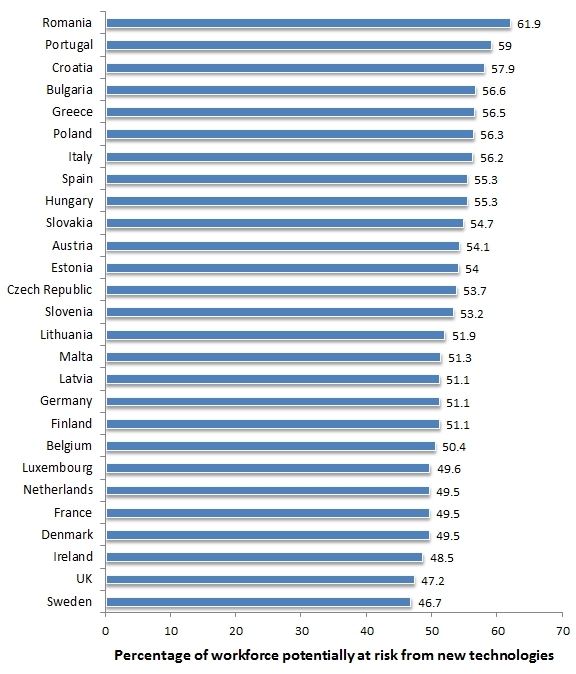 The article contains a Chart (approximated below) showing the countries across the EU whose workforce is most at risk from these technological advances, with countries in Northern Europe generally having the lowest levels of risk. Note: Figures taken from Bruegel, please read the original article for a full explanation of the calculations.